What better time than Mother’s Day to consider how the design and furnishings of Montpelier reflected the presence of the matriarch of the Madison family – James Madison’s mother Nelly Conway Madison – and how one family accommodated two generations under the same roof. Montpelier was built by James Madison senior in the 1760s to house his immediate family. In 1797 when James, Jr. took a temporary hiatus from politics and moved home with his bride Dolley, father and son added a two-over-two room duplex with a side passage to house the younger couple. When, following his father’s death, James junior enlarged and remodeled the building once again, he did the opposite carving out a suite of rooms on the first floor for his widowed mother. Nelly Conway Madison was a remarkable woman. She oversaw the domestic management of her husband’s plantation, gave birth to twelve children, helped to educate them, and lived to age 98. 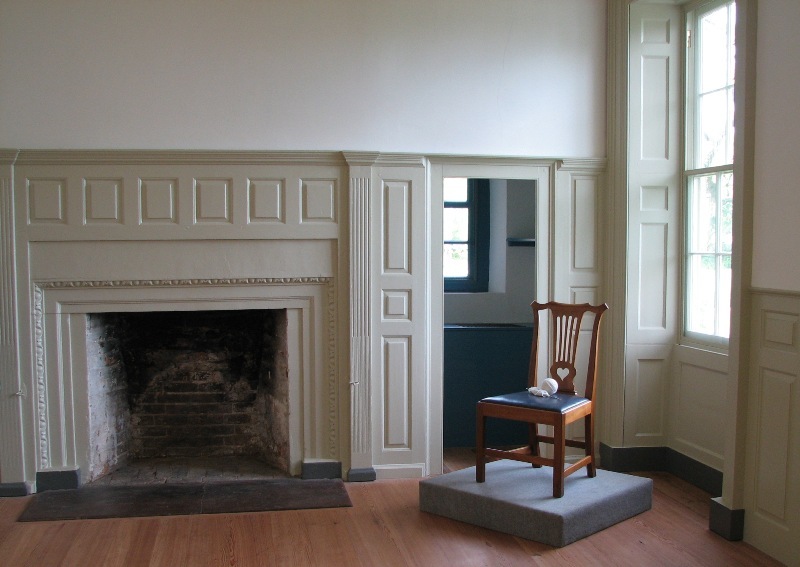 In recognition of the important role she played in the Montpelier community and to illustrate the inclusion of two households under one roof, Mrs. Madison’s Best Room (M112) is one of four rooms which have been singled out for refurnishing. Our challenge will be to show how different Nelly Madison’s apartments were from the rooms occupied by her son and daughter-in-law. Even when empty, her Best Room shows a fondness for the past retaining features from the 1760s era house including a high wainscot which lines the walls and the British-made sandstone fireplace surround with its weighty egg and dart carving. Smith’s account is full of information, but where to start? We have decided to begin implementation of the “soft furnishings” – curtains and carpets – in the four target rooms for initial consideration. Why those? There are many Madison documents and purported Madison objects still to research, and we do not want to get ahead of ourselves in making decisions on the furnishings for recreated rooms. 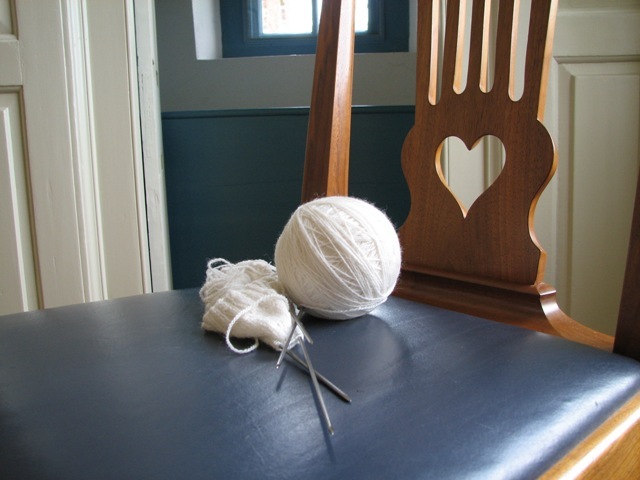 However, we already have in hand clues to a number of the soft furnishings – some in the accounts of visitors, some in other period documents, and some in the physical structure of the house itself. For now, let’s just look at curtains in Nelly Madison’s Best Room. Initially, we look at clues and inevitably, more questions arise, and we tackle those, too. The research on curtains is a work in progress, and this is the first installment of documenting our efforts. An 1829 inventory, a rather straightforward listing of the items she owned. An 1829 account of sales, meaning that some of her possessions were sold at a public auction where each object, the price it sold for, and its purchaser were recorded. The estate inventory of her husband James senior taken in 1801, presents a picture of the furnishings that filled the rooms when he died. At that time, the couple occupied both floors of the original house. Unfortunately, neither of the inventories were taken room-by-room. James senior’s inventory mentions pairs of curtains made of “Calico” and “Stuff.” The term “stuff” was usually synonymous with wool. Does this correspond to the “thick rich curtains” which Smith mentions? Neither Nelly’s inventory nor the account of sales list curtains at all. Does this mean there were no curtains at the windows when Nelly died? Unlikely, since Smith’s account suggests she saw curtains at least in the room in which Nelly received visitors. Were any curtains attached to the windows considered part of James junior’s possessions as legal owner of the house in 1829? Were the curtains in such poor condition from so many years of wear and not worth listing or selling? Were the thick rich curtains even the curtains mentioned in James senior’s turn-of-the-century inventory? When James junior remodeled the house in 1809-1812, virtually all of the windows were replaced, so that they would match throughout the house. How much did the size of the windows change? Could Nelly have re-used the curtains from the original house or were new ones made? Stay tuned for more information on what we are learning regarding curtains in this and other rooms in the mansion. Is there physical evidence of early curtains on the window frames? If so, what do furnishing textile experts make of this? And could scraps of fabrics harvested by rats and mice for their nests offer any clues? 1 James K. Paulding, “An Unpublished Sketch if James Madison,” Ralph Ketcham, (ed. ), Virginia Magazine of History and Biography, vol. 67:4, October, 1959, 432 -437. 2 Margaret Bayard Smith, “Mrs. Madison” in National Portrait Gallery of Distinguished Americans (New York, NY 1836), 1-10. This entry was posted on Friday, May 8th, 2009 at 9:53 am and is filed under Curatorial. You can follow any responses to this entry through the RSS 2.0 feed. You can leave a response, or trackback from your own site.